First up is the slightly cheesy yet amusing 80s spot for Oldsmobile, which also features Starr's daughter, Lee Starkey. Somehow I don't think a Beatle's daughter would actually be driving this "Fab four door" in real life, do you? Ringo also filmed a series of commercials for Sun Country wine coolers in the...well, of course the 80s, when wine coolers were big. 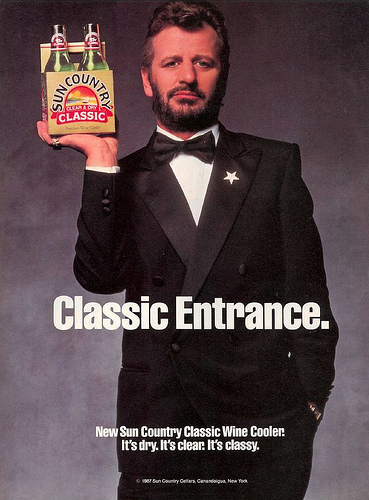 There's some irony in this advertising match, as Ringo admitted to having a drinking problem around this time and checked himself into the Betty Ford Center for alcoholism in 1988. Something tells me he won't be promoting alcoholic beverages again anytime soon, which is too bad because these advertisements are kinda funny..."Classic noooooose!" Now this Pizza Hut one from the 90s is one of my all time favorites; I'd consider this advertising gold as far as clever commercials go. It's just too perfect because it contains not one but two surprises. The first time you watch it, naturally you think Ringo's big announcement is that he's talking about reuniting with the surviving Beatles, when really he's talking about inviting them to eat Pizza Hut's stuffed crust pizza crust first. But the real kicker is seeing the Monkees show up ("wrong lads")! Kudos to the agency that dreamed this one up. Ringo also did a few Japanese commercials for an apple juice product; according to the description for these clips, ringo is the Japanese word for apple. How convenient - someone thought he was the perfect choice for a spokesperson/surprise guest in these amusing spots. Lastly is this credit card ad featuring Ringo's artwork - I remember this one from when I went to see his All-Starr Band perform in the mid-90s. Personally I think he should stick to drumming. Did I forget anything? If there's anything else that Ringo has shilled, please let me know! I think you covered all the Ringo ads except for some radio spots for his own work. I love the Pizza Hut ad. Ringo has also appeared over the years on Saturday Night Live and spoofed himself several times. BTW read critical reviews of his drumming on Beatle records. He was spot on, reliable and nearly flawless. How many of us can hold up to critical assessment of our work over the years? Ringo is a classic! Upon seeing this some may think that Ringo would sell out at the drop of a hat and I don't think that's the case. If John was the smart one, Paul the cute one, George the quiet one, Ringo was... the fun one. He wasn't uptight about his celebrity and poked fun at himself without worrying if he was "selling out" or not. Yep, classic, as he says so himself in the Sun Country wine cooler spots. All of these commercials make me laugh/smile. 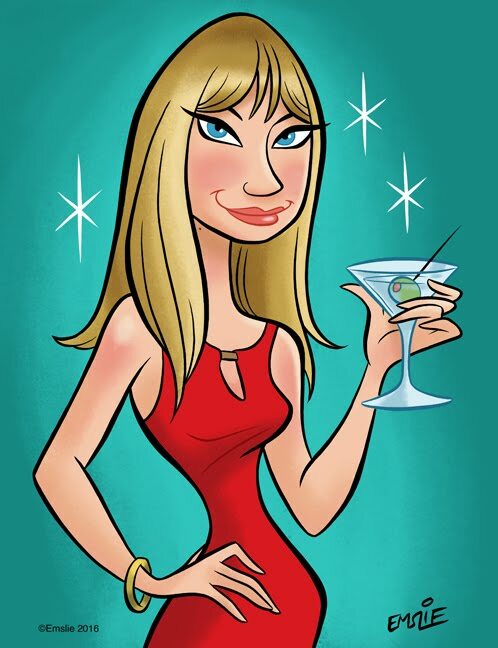 I love the Pizza Hut and wine cooler ads, they were funny. I can't say that I remember them from back then though. I'm glad that you shared these. Now I'm remembering how my friend and I used to drink wine coolers sometimes - Bartyll and James and I think Seagrams too. I saved a couple of the ads for today but they weren't showing up, maybe I'll try again tomorrow. Guess he sold out huh cause he sure as heck didn't need the money I bet. You missed Ringo's Japanese ads in 77 for Simple Life Leisure Suits. Dokking Simple Life. Complete with theme song sung by Harry Nilsson, Davy Jones and Mr Starkey. There were four different ads each with a strange space ship theme. oh, almost forgot. Ringo take's on Wall Stret with Charles Schwaab ads. Thanks, RevGreg! I remember the Charles Schwaab commercial and I just found one of the leisure suit ads on YouTube. Love the flash from the past of a famous face. I always thought of Ringo as the accessible one - he was like the stand in for the rest of us - average Joe with a dream, the guy who got the big break and loved (loves) every minute of it. How can that not be endearing? Wow.. nice bit of research on your part doll!! Boy... I do remember him being EVERYWHERE back when I was a kid. Hey.. remember the movie CAVEMAN?